During the past week my wife Chris and I have been in transit from Peru, to Austin, and finally to Berkeley, and we are now setting up our new home. Much neglect of this blog has ensued. I did, however, want to pass on two interesting links. The first, brought to my attention by Jane Simpson over at Transient Languages and Cultures, is a link to the draft of the LSA’s ethics statement. The statement itself is available here. The draft statement is cleverly set up as a series of blog posts, with each major section getting its own post, with its own comments section. (The front page of the blog is here.) This seems like a nice way to get discussion going among linguists, and there have already been some interesting comments posted. Also included are links to ethics statements by other professional organizations such as the American Anthropological Association. On a related note, Claire Bowern over at Angarrgoon (who also mentions the LSA ethics statement blog) provided a link some time ago to Institutional Review Blog, which is maintained by Zachary M. Schrag, an Assistant Professor of History at George Mason University. According to its subheader, the blog is dedicated to providing “[n]ews and commentary about Institutional Review Board oversight of the humanities and social sciences.” Schrag is apparently preparing a book and he posts frequently. His perspective seems like a valuable complement to discussions going on at places like Savage Minds (e.g. here, here, and many others). Meeting Description: This conference is the second of a series of three meetings, as part of a cooperation initiative between the CELIA Paris, UFAM Manaus, Leiden University, and the VU University Amsterdam research centers. The themes to be discussed at the second meeting are ‘nominalization’ and ‘word-prosodic systems’. Although the nature of the meeting is that of a seminar for which part of the contributors are individually invited, there is space in the program for non-invited speakers, which we wish to encourage submitting a paper through this call. In addition, the meeting is open for students and scholars that are interested in assisting without presenting a paper. Since deverbal nouns have the ability to recover the arguments of their finite counterpart, nominalization is one of the procedures that languages make use of to put a verbal predicate in a position of dependence with regard to another predicate. The link between nominalization and subordination is more or less tight cross-linguistically. Very visible in Turkish, Tzeltal, or Arabic, it is pervasive in the Amazonian languages. Several typological issues must be addressed in considering the relation between subordination and nominalization. First, the way in which the recovery of arguments is achieved, since the case assigner is a noun. When the nominalization concerns a transitive verb, one observes a relatively general tendency for ergative alignment, which has a direct incidence on the way syntactic pivots are established between the main clause and the subordinate clause. Second, the loss of the finiteness properties of the verb and the acquirement of typical nominal categories (gender-classes, quantification, definiteness) can reveal a continuum the landmarks of which have to be stated language particularly. Since the deverbal construct generates a noun phrase, the subordination markers will often be recovered from the inventory of adposition type relational markers. With respect to relativization, the designation ”headless relative” sometimes obscures the necessary distinction between a clause in a modifier position in a noun dominated phrase and a deverbal noun in the same syntactic dependent position. Moreover, in languages that allow a certain degree of choice in discourse between a finite dependent clause and a deverbal modifier, the semantic and pragmatic correlates of each option must be highlighted. The diachronic recovery of finiteness properties by deverbal forms, often accomplished through a reanalysis of the nominal morphology, may cause changes in the alignment patterns. More specifically, the study of the relations between nominalization and subordination, if taking into account the so-called masdar form in the Arabic grammatical tradition, is very well-suited to shed a new light on that hybrid form known from many Tupi and Jê languages, which the tradition of Tupi-Guarani studies calls ”indicative 2”. An assessment of any typological feature in South American indigenous linguistics is premature. Although for certain families (e.g. Tupi-Guarani) available descriptions are sufficiently good and numerous to allow for interesting family-wide observations, for many others there is almost nothing. This is especially true regarding the characteristics of the word-prosodic systems (stress or tone based) that exist in the Amazonian languages. Even among the ‘well-documented’ languages, very few have had their word-prosodies analyzed in a meaningful way. The descriptions are mostly sketchy, sometimes no more than a generic statement and contain few, if any, examples. A systematic consideration of word-level stress and/ or tonal patterns including detailed accounts of morphological or lexical conditioning is rarely encountered. Terms such as ‘pitch accent’ are used often with a vague definition and are employed to refer to systems that are very dissimilar. For this conference we wish to invite papers that present detailed analyses of word-prosodic systems in the Amazonian languages, preferentially based on laboratory evidence. The abstract should be no longer than 2 pages including examples and bibliography, single spaced, Times New Roman, pitch 12. The abstract should be send in both Word/W and PdF formats to the local organizers. In an earlier post I outlined my plans to do some exploratory work this summer on Andoa, a minimally documented Zaparoan language spoken on the Rio Pastaza, near the Peru-Ecuador border region. As I was preparing for my trip to the Rio Pastaza, however, some of my travel arrangements fell through, and it became apparent that I would not be able to make it to the Andoa community in the time I had available. Fieldwork on Andoa would have to wait until next year. I thus found myself in the lovely city of Iquitos with a free week on my hands. Perfect, I though, this would be an opportunity for me to see if I could find any speakers of Vacacocha. Now, if you haven’t ever heard of Vacacocha (also known as Aushiri), you are not alone. It is among the most poorly documented of Peruvian Amazonian languages, and the language is known only from a few short word lists, none of them collected by trained linguists (a bibliography of Vacacocha references is available here (pdf)). Based on this limited information, the language is considered by most classifiers to be a linguistic isolate, but for the most part, so little is known about the language that it tends to elude linguists’ attention. The one clue about where to locate speakers of Vacacocha, repeated in many sources, is that in the early 20th century, there were several families of Vacacochas in a place on the Rio Napo known as Puerto Elvira. Two days later, then, I found myself on the Rio Napo with a theoretical destination and a general direction to head in — upriver. After two more days’ travel up the Napo I pulled into Puerto Elvira, a community of about 200 people, situated on a bluff overlooking a majestic bend in the Rio Napo. Shortly after touching down I was shuttled over to the community’s three school teachers, who politely asked me what I was doing in their community. After I explained that I was looking for speakers of Vacacocha, the teachers put their heads together and came up with some recommendations for whom I might speak to. I spent the remainder of the afternoon shuttling back and forth between various little islands upriver of Puerto Elvira, following up on suggestions about where older individuals with some knowledge of Vacacocha might be found. Eventually I met Delia Luisa Andi Macahuachi, a slight woman of some 70 years, who explained that she spoke Vacacocha as a child, and had used it intermittently as a young adult, but had not spoken the language in several decades. She expressed willingness to work with me, however, to document anything she could remember. It very quickly became apparent that the language is tonal — in fact, shortly after beginning the first elicitation session, Delia reprimanded me for repeating the words with a flat intonational contour, and I subsequently paid more attention to carefully reproducing the tone contour of the words. Also obvious is the fact that the language has a contrast between oral and nasal vowels. Neither the tonal nature of the language nor the oral/nasal contrast is mentioned in the available material on the language, so it became clear that even if I were only able to collect lexical data, it would be possible to significantly improve linguists’ knowledge of this isolate. From what I was able to determine, Delia is the only remaining individual in the Puerto Elvira area with any significant knowledge of Vacacocha. During the two days I was with her, Delia worked hard to remember aspects of the language she had not used regularly in close to sixty years. Although she initially found the work frustrating, she came to find the exercise of recovering long-dormant parts of her knowledge quite gratifying. I promised to return to her at the earliest opportuniry a copy of all the words and phrases I was collecting from her, and she was especially excited about the idea of leaving the linguistic documentation as a legacy for her grandchildren. Delia and her family members mentioned another relative who they considered to be the best and sole other remaining speaker of the language. Unfortunately, this other speaker was taken several years ago by her children to live on the Rio Momon, near Iquitos, and I did not have the opportunity to work with her. I hope to locate her next year. After two days, I had to return back downriver, as I had other pending fieldwork obligations. I was quite excited, however, to have found at least one semi-speaker with who I could work to recover aspects of Vacacocha phonology and lexicon, and I am looking forward to returning next year to make some further progress. I arrived back in Lima a few days ago, which means that I have been meeting with colleagues and friends in the short time that remains before I return to the US. One of more interesting meetings was with Karina Sullón, a young Peruvian linguist whom I came to know through her participation in the Iquito Language Documentation Project. Karina returned recently from an exploratory trip to the community of Munichis, near the town of Yurimaguas, where the last speakers of Muniche live. The purpose of Karina’s visit, for which I helped obtain funding, was to determine if a project aimed at the documentation of Muniche would be feasible. The only significant documentation of the language to date is Gibson (1996) (available here), which provides a description of the phonology and morphology of the language, and a small lexicon. 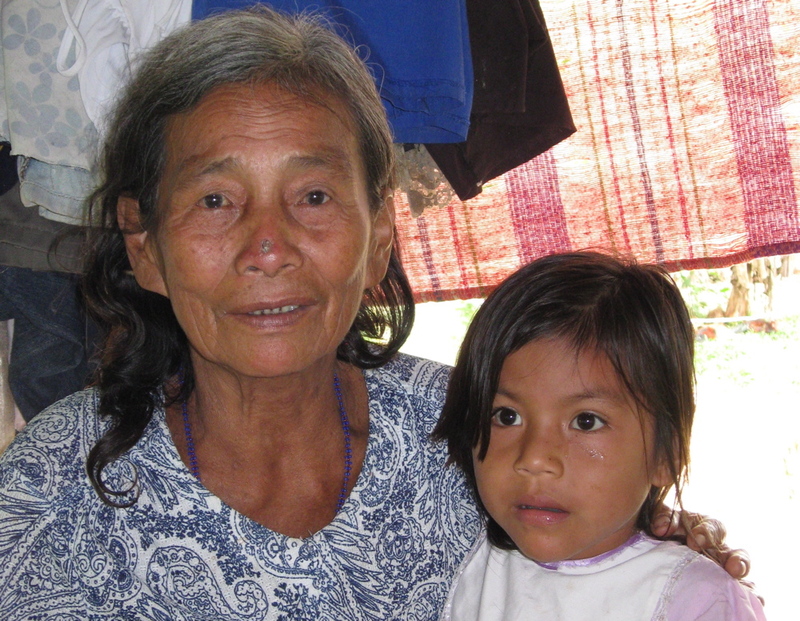 The last fluent speaker of the language died in the late 1990s, but Karina found several ‘rusty’ speakers who retain significant knowledge of the language. In the course of a week’s work with these speakers, Karina determined that lexical, morphological, and basic syntactic work was feasible with these speakers. Given the modest documentation available on this language, a limited documentation project seems worth the effort, and Karina will be returning soon for a month of documentation work. I am very much looking forward to seeing the results of Karina’s work. Gibson, Michael L. 1996. El Munichi: Un idioma que se extingue.‭ Serie Lingüística Peruana, 42. Pucallpa: Instituto Lingüístico de Verano.